Black+Decker’s BDCR20B is a lightweight reciprocating saw that is perfect for jobs with low to moderate difficulty. It is nowhere near fancy but it sure gets the job done the way it is supposed to. Go over this quick review to know what makes this recip saw stand out in our book. We will take a look at its features and compare it with others of its kind so you can decide if it is the recip saw for you. Short stroke length allows for more delicate and precise cuts. Variable speed control provides flexibility. Blade changes are easy and simple. It is highly portable and convenient to use due to light weight, compact size, and cordless power source. It does not cushion the vibration. The first couple of times that we used a reciprocating saw, we were so amazed at the sheer number of things it could do. Although it is mainly marketed as a demolition tool, it is just as useful for construction, renovations, and miscellaneous projects. With all this hype surrounding recip saws, we soon got too excited and found ourselves looking around for expensive, top-of-the-line saws with a lot of nice features. However, we soon realized that we did not really have any need for such advanced recip saws. We almost never did any work that required more than what basic, relatively cheaper saws could do. That was how we eventually decided to settle for the BDCR20B. It is affordable, lightweight, and does an excellent job for its size and price. The BDCR20B is for the average DIY-er and handyman who do not have a lot of demanding cutting operations on their hands and just need something that simply cuts. Its features are pretty standard. It has variable speed that provides flexibility, a modest stroke length that helps a lot when making delicate cuts, a tool-free blade change mechanism that cuts downtime, and a pivoting shoe that improves stability. More importantly, it is lightweight, compact, and portable. There is no need to lug around a heavy, hulking piece of tool if you will only be doing minor cutting. Reciprocating saws have many uses--from basic jobs such as metal and PVC cutting to unusual ones like emergency rescue operations. You can make a plunge cut by cutting through the surface of the material right in the middle of the cut. Angle the saw blade against the surface before cutting and make sure you are using the appropriate blade for plunge cutting. Tree cutting and pruning are two of the most popular uses of recip saws. The advantage to using a recip saw to do this kind of work is that the electric brake in the saw makes for a much safer job. In addition, you can hold the saw in one hand and the tree branch in the other--something you can’t do with the other popular tree cutting tool, the chainsaw. Yes, your reciprocating saw can cut through rock. When dealing with concrete, bricks, and masonry, you need to use toothless saw blades coated with tungsten carbide grit abrasives. A single high-quality blade like that should be able to cut between 70 to 100 bricks. The recip saw is one of the staple tools of an emergency rescue team. They use it to cut through vehicle windshields. It is usually done by plunge cutting and slicing the glass. Although there are saw blades specifically meant for drywalls, you may still have to make some adjustments in the saw’s stroke length by shortening the blade. This ensures that you are only cutting through the drywall and not the studs or any wiring or pipework behind it. Pry tiles off the floor with the use of a so-called scraper blade recip saw attachment fitted into your saw’s blade mount. That way, you can lift the tile without causing it to tear. Plumbers, electricians, and HVAC installers make plunge cuts more often than other workers do. A reciprocating saw will benefit them greatly especially if mounted with an easy-plunge blade with a rounded nose and teeth on both sides. This blade type cuts through pipe and steel effortlessly. 12-in blades are ideal for cutting large, dense meat such as those of elks and bisons. 9-in hunting blades, on the other hand, are meant for mid-sized animals such as deer and antelope. Finally, the 6-in blades are for clearing limbs. The BDCR20B is a lightweight and compact recip saw, weighing merely 3.8 lbs. It has a variable speed motor with a range of 0-3,000 spm and a trigger located on the handle. Its stroke length is ⅞ in, making it ideal for use when cutting through thin materials. Features for added convenience and ease of use include a pivoting shoe and a tool-free blade change system. While batteries are not included with each purchase of a BDCR20B, you do get a saw blade, which other bare-tool items do not include. No offense to the BDCR20B, but we think of it as a sort of mini tool you can take anywhere you want to work. Its super light weight makes it highly portable. You can carry it on your belt all day and you will not so much as feel its weight. In addition, since it is not cumbersome, you can keep it anywhere without having any storage problems. It should also perfectly fit inside a bag if you have to travel with it. The BDCR20B has the ability to reach and get into tight or narrow spaces that a cord would limit it from getting to. When working with a cordless recip saw, nothing stops you from cutting even at the weirdest locations and angles. Having a cordless unit also means you can use it even in remote work sites without having to bring extension cords or bulky generators. The BDCR20B’s variable speed control gives you the ability to adjust how aggressively you want to cut. You can speed up for a faster, more rugged cut or slow down for a relatively more delicate operation. Its variable speed trigger is conveniently located on the handle so you can easily and directly adjust your cutting speed as you work. Changing blades used to require the use of wrenches and other tools. Black+Decker takes care of that inconvenience for you by designing a tool-free blade change mechanism in the form of a lever located near the blade mount. You flip the lever to release the old blade and to insert the new one then replace it to lock the blade in position. While many reciprocating saws in the market have stroke lengths of around 1 in and more, the BDCR20B has ⅞-in strokes. This relatively shorter stroke is good if you are cutting thinner materials, if you just do not want to penetrate your material too deeply, or if the part you are taking apart is awfully close to parts you do not want to damage. Although the BDCR20B is very affordable, we still took the time to read many of its reviews online just to find out what other users think about it. Most of the comments were positive and easily convinced us to get ourselves one of these saws. Most of the positive feedback is about how this recip saw performs excellently for its price. Many DIY-ers are very happy with how this tool has helped them with their daily cutting work. The most prominent negative comment is about the saw’s vibration. There does not seem to be any material on the BDCR20B to reduce the transfer of its vibration to the operator’s hand. This can lead to discomfort after just a couple of minutes of cutting and can even cause an earlier onset of fatigue. The other complaints have to do with parts of the saw falling apart or not working, and about how this cordless saw does not perform as well as corded ones do. However, many of these comments are not repeated, which can mean that they are isolated cases. Also, it is an established fact that corded saws will always perform better than cordless ones so we do not think it would be fair to expect the BDCR20B to work the way a corded saw does. Overall, people are happy with the value the BDCR20B gives for their money, making this a recommended recip saw for any handyman looking for a good budget recip saw. The Tigersaw measures 14.5 in length and weighs 3.8 lbs. It cuts at a variable speed of 0-3,000 spm with 1-in strokes. Like the BDCR20B, the Tigersaw has a tool-free blade change system and a pivoting shoe for added convenience and stability when cutting through any material. One good thing about it is that it has a contoured handle which is designed to minimize the possibility of fatigue caused by the recip saw’s vibration. Makita’s compact saw has the same variable speed range as the BDCR20B but has an even shorter stroke length, which is just ½ in. That makes the XRJ01Z even better at making relatively precise cuts on thin surfaces. There is also a tool-free blade change mechanism on this tool. What we like about this recip saw is the built-in LED that improves visibility. It is a small feature with a huge benefit. Other features include a soft-grip rubber handle for improved control and good absorption of tool vibration. In addition, there is a dual-position power switch for convenience. The Hackzall M18 has the same variable speed as the BDCR20B and a slightly shorter stroke length of 0.75 in, which is just the ideal stroke length for a variety of materials with different densities and hardness. The Hackzall M18’s claim to fame is its dual-gear anti-vibration system that lets you make more precise cuts safely. Finally, this recip from Milwaukee has a Quik-Lok blade clamp in place that allows for tool-free blade changes. Bosch’s GSA18V-038B measures 15.75 in and weighs 4.4 lbs, which is just slightly heavier than the BDCR20B. The GSA18V-038B’s size, weight, and design enable you to cut in tight areas and overhead locations easily. This saw’s variable speed range is 3,050 while the stroke length is 0.83 in. It has a tool-free blade change mechanism and an LED that illuminates the work area, similar to Makita’s XRJ01Z. This recip saw’s no-load variable speed range is a lot wider than the BDCR20B’s, going from 0 to 3,300 spm, while the stroke length is 1 in. The CR18DGLP4 has the standard recip features such as a soft-grip handle and a tool-free blade change system. The unique feature of this product is its fade-free power caused by the powerful Hitachi 18V Lithium-ion slide-type batteries, which are recommended to power this saw with. Instead of finding a reciprocating saw that can do a lot of things, sometimes it is better to just find a saw that can do just what you need. After all, all that extra power is not going to benefit you if it does not get applied in your day-to-day work. 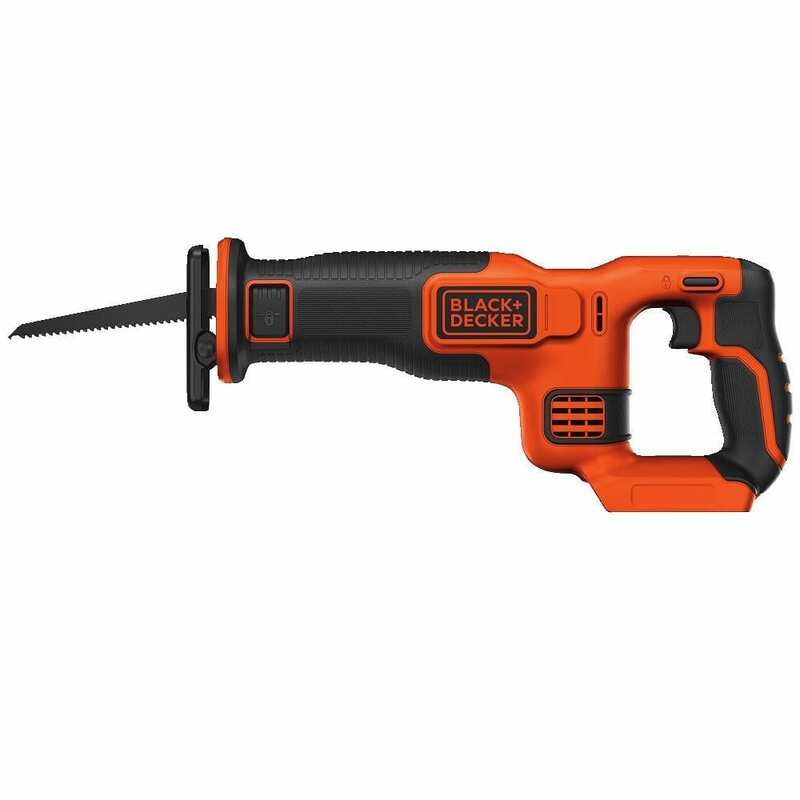 Black+Decker’s BDCR20B is small in price and size but does a tremendous job if you know what to use it for. It is light, compact, portable, and can take on a wide range of cutting applications.